Passion Whole Heart is the live worship album from the 2018 Passion Conference which took place in January of this year. Passion Conference 2018 was a beautiful worship experience, and the live album captures each powerful moment, allowing those who were not in attendance to experience it. “Rooted out of the Passion movement, we are committed to leading people towards renewed intimacy with God and fresh encounters of worship. Passion is more than music. More than events. Passion is a generation living for His name.” Whole Heart features Passion Artists: Kristian Stanfill, Melodie Malone, Sean Curran, Matt Redman, Crowder. I enjoyed this album and I hope some of these songs will make their way into the worship services at my church. I think the song that speaks to me the most is “More like Jesus” which is in the video above. The chorus, “If more of You, means less of me, take everything.” Powerful stuff. Another favorite is “God You’re So Good”. I like this one because it does something I often did when I was leading worship, it takes a familiar chorus and personalizes it and sings it straight TO God instead of ABOUT God. “All My Hope” is also a favorite for the sheer fact that I can’t get it out of my head. 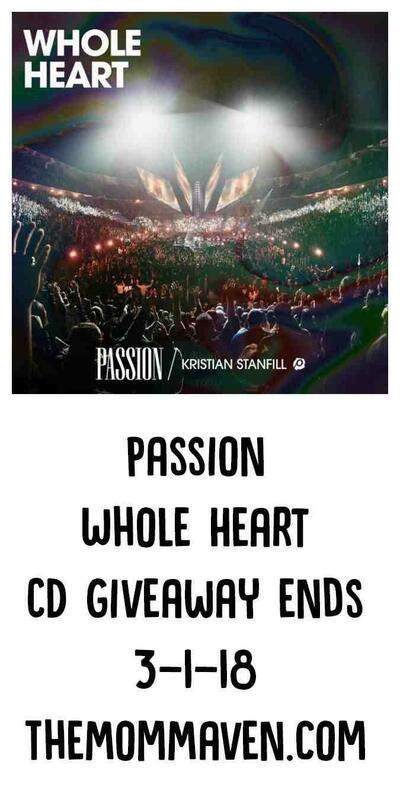 I am giving away 1 copy of the Passion Whole Heart CD. This giveaway is open to US residents only. The winner will be chosen by Rafflecopter and verified. The winner will be notified via email and they will have 48 hours to claim their prize. Only one entrant per mailing address, per giveaway. If you have won a prize from our sponsor Propeller /FlyBy Promotions in the last 30 days on the same blog, you are not eligible to win. Or if you have won the same prize on another blog, you are not eligible to win it again. Winner is subject to eligibility verification. This giveaway ends at 12:00am on 3-1-18. Apparently, I have to admit to ALL of them because before I even entered I looked each one, individually up online to watch or listen to youtube videos on as many as I could, which was most of them. I especially loved Kristian Stanfill’s songs so glad he has 3 on there and I also loved Crowder and Tauren Wells on the last song of All My Hope. I always end up teary eyed when I listen to this kind of touching music. I just listened to More Like Jesus (feat. Kristian Stanfill), and I love already!!! WOuld love to win the CD. thanks for the giveaway! I would say More Like Jesus based on the title alone. I’m most intrigued by Ghost. David Crowder always writes interesting lyrics and from interesting angles, and that title piques my interest. I would love to listen to “Heaven”. All my Hope, I would play that one on repeat. I love David Crowder! i am excited to hear almighty God. i am sure i will love them all. I want to hear Heaven. I really am excited to hear Almighty God.